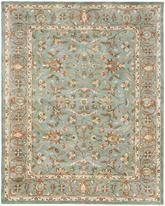 What’s the difference between a tufted rug and other types of rugs? 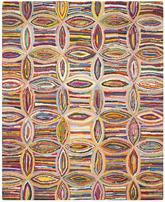 Hand tufted rugs are made by pushing wool or acrylic yarn through a backing called a tuft. Glue holds the tufts in place, a secondary foundation is applied, and finally a cloth backing is added to protect the floor the rug is placed on. 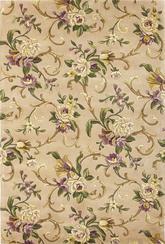 Hand tufted rugs are usually less expensive than hand-knotted rugs because they can be manufactured much faster. 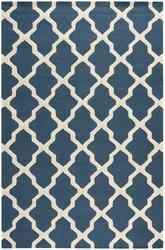 These rugs are also durable and weather foot traffic well. 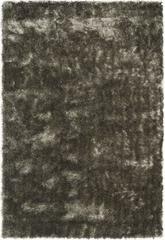 Find hand tufted wool rugs online at discount prices that will have you reconsidering buying hand woven rugs or hand hooked rugs. 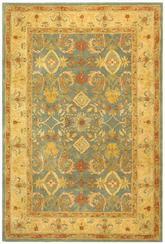 You’ll be impressed by the style options these versatile rugs present at such low prices. 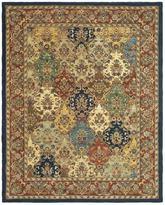 If you’re not in the market for a large rug, hand tufted area rugs are available in 10 x 14 area rugs, 5x7 area rugs, and area rug sets. 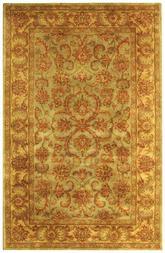 Hand tufted area rugs are a beautiful tradition with a lot of elegance behind them. 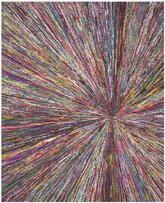 These rugs are made painstakingly, one fiber at a time, and they look amazing when they’re finished. 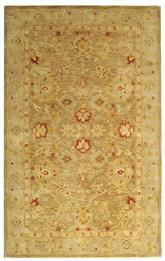 Instead of traditionally hand looped or hand knotted rugs, hand tufted rugs are made in a different way that doesn’t utilize knots at all. 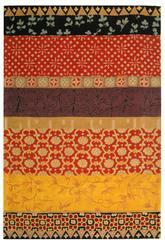 Because of this, they’re a little bit more delicate than other handmade options, and they’re much more delicate than machine made and power loomed versions of area rugs. 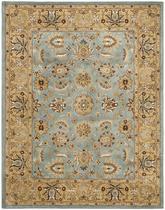 However, if you don’t mind taking a little extra care with your rug, a hand tufted rug can be an incredible part of your home for a long time to come. 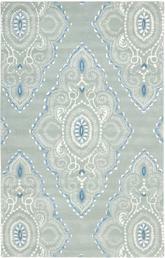 What are Hand Tufted Area Rugs? 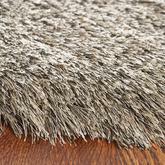 So what is a hand tufted wool rug? 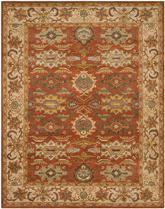 These rugs are the same as traditional tufted area rugs, but instead of being made with a power loom or by some other type of machine, they are made completely by hand. 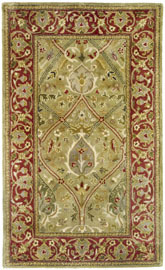 The process of making a hand tufted wool rug is the same as it is when a machine is used for the production process. 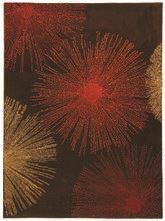 During this process, fibers are pushed through a durable backing that has been printed with the final design of the rug. 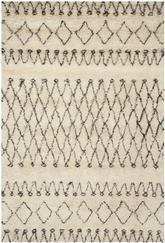 There are a few different tools that can be used to do this, but a hand-tufting gun is the most common. 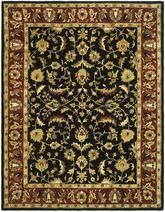 Hand-tufted rugs are usually more likely to be one-of-a-kind than a machine made tufted rug is, but they are still often mass produced. When they’re made by hand, they still cost a bit more than when they’re made by a machine, but the cost is still significantly lower because they don’t take nearly as long to complete. 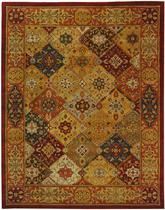 It doesn’t usually take as much fiber to get these rugs completed, either, and they’re built to last for a long time with a protective backing to keep them safe. 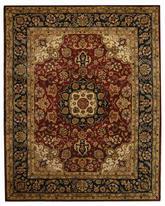 These rugs can be made of all sorts of materials, either synthetic or natural, but wool is the most common. 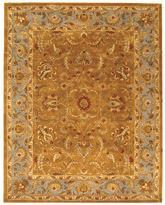 Hand tufted wool area rugs as well as handtufted rugs made of other materials are available in plenty of different sizes to help you create the room of your dreams. 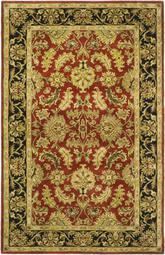 When choosing the right size hand tufted rug for your home, you first need to decide what type of style you want to work with. 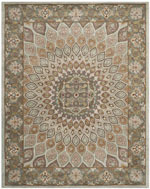 For example, do you want to put together a very contemporary, upscale, and modern room? 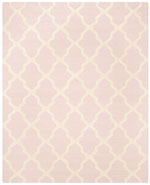 If so, hand tufted area rug options might be a little difficult to work with, but that doesn’t mean you can’t make it happen. You’ll just need to be choosy about your sizes, and going with something extra large can help you bring that vibrant, bold style that goes so well in contemporary rooms into your home. 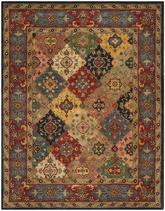 On the other hand, for something more traditional, stick to standard rug sizes like 8x10 or 8’ round rugs, or consider going even smaller. 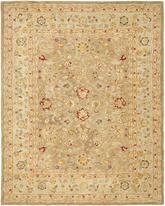 In hand tufted wool rugs as well as other materials, smaller sizes don’t necessarily equal non-traditional rugs. 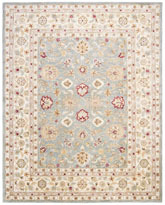 The real deciding factor when it comes to the style you end up with is the color or pattern in the rug, so when you want to go traditional, choose mid-size to small rugs and be sure to select ones with small, delicate floral patterns whenever possible. 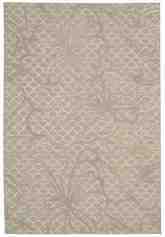 What Shapes of Hand Tufted Rugs are Available? 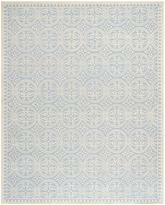 Hand tufted rugs are easy to find in a huge variety of different shapes. 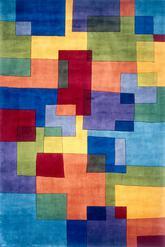 For a very traditional space, stick to the common themes in terms of shape, such as square, rectangle, and runner. 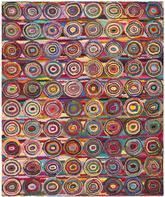 Even a round rug can be an interesting stylistic choice in a traditional room, especially when you choose one that has a very traditional pattern and works with colors that are reminiscent of traditional designs. 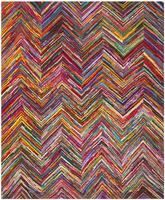 If you prefer to go with something a little smaller, a hearth rug with the right kind of pattern can also work well for this type of room. 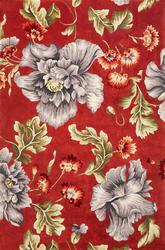 However, if you’re hoping to go a little more contemporary or even just transitional, you’re in luck. 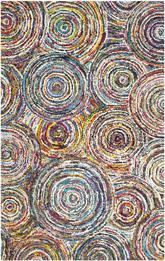 These beautiful hand tufted rugs can be found a handful of fun and exciting shapes that you might not find in all types of rugs. 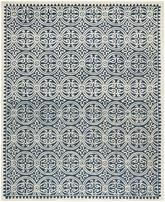 For example, you can choose an oval or octagon shaped rug for something transitional that still borders on the traditional but is a little bit different. 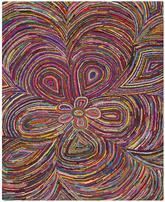 On the other hand, if you want something completely quirky and whimsical, try a kidney shaped or star shaped rug with a bold abstract print. 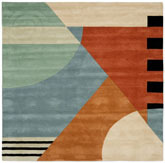 Nothing says modern like a bright, colorful rug shaped like a kidney on the floor of your bedroom! 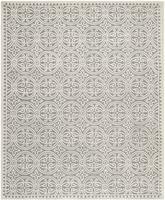 What is the Best Room for Using Hand Tufted Rugs? 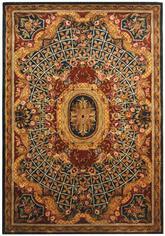 Hand tufted rugs are handmade, which means they’re a little more delicate than machine made and power loomed rugs. Because of this, they might not be a great addition to every room in your home. 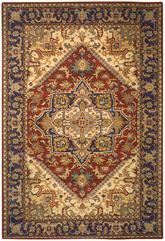 It’s usually best to keep these rugs away from your dining room and kitchen, because there is a high potential for them to get stained or damaged beyond repair in these rooms. 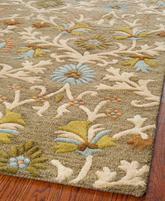 If you absolutely must use a hand tufted rug in your dining room, try to keep it far away from the table. 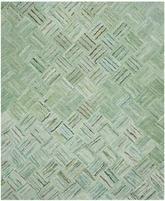 A machine made or even hand woven rug can be a better option for this part of your home, however. 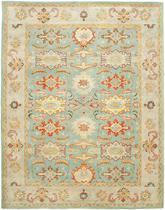 In the living room or bedroom, hand tufted rugs can help you create the perfect style. 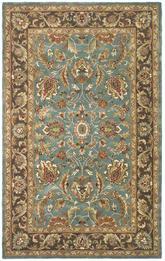 For a delicate and airy sitting room, try incorporating a rose tufted rug with a soft jade green and gray floral pattern into a room with matching gray and green décor. This will create a garden style room that’s worthy of entertaining any guests in an old-fashioned and traditional space they’re sure to love. 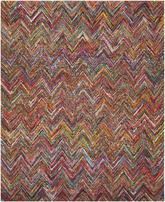 In the bedroom, try to work with more contemporary colors and shapes and be sure to choose a vibrant rug to help you get the job done. 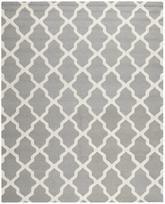 Hand tufted area rugs come in a variety of different shapes and sizes to help you choose the right one for you. Because they’re designed by hand, it’s much easier to shape them into just about anything you could want for your home. 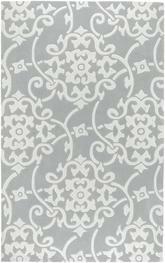 With a uniquely-shaped hand tufted rug, you can create an interesting transitional space by sticking to a more traditional floral or geometric pattern. 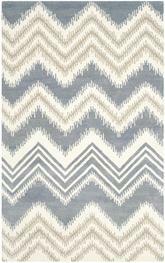 On the other hand, a more contemporary and abstract pattern on a standard rectangular rug can be an interesting way to make your interior spaces come to life, too. 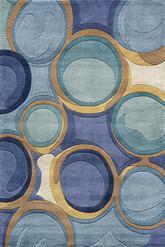 You can do all this and so much more with a hand tufted rug.